It’s that time of year, folks – the first leaves have started to turn, pumpkin spice is flowing through our veins, and Halloween is on its way. October’s monster posts are sure to be a real treat (or trick), so let’s kick things off in the Halloween spirit with some spooky scarecrows. Released in 2007, these episodes were adapted from a Doctor Who novel, also called Human Nature. The TV version features the Tenth Doctor and his then-companion Martha Jones. To escape a group of alien villains hunting the Doctor’s Time Lord immortality, the Doctor disguises himself as a human. His human alias, John Smith (yes, really), becomes a teacher at a boys’ boarding school in 1913 England – and believes his Time Lord memories are simply fantasy. When the aliens track him down, Martha has to convince John to sacrifice his human life and become the Doctor again. Yeah, okay, so what does that have to do with scarecrows? No, there are no evil space scarecrows chasing the Doctor – these straw men are not the main villains of the episode, just their minions. 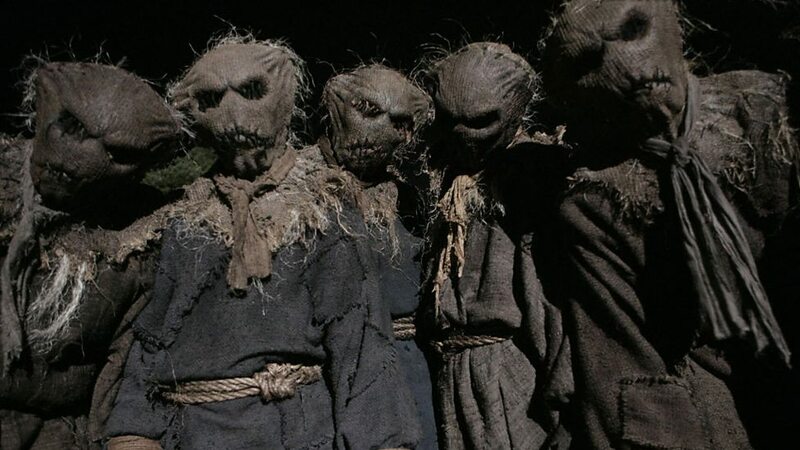 The true villains somehow animate a bunch of regular old scarecrows and turn them into an army of unthinking burlap pawns. Not undead – they were never alive in the first place – but they’re not far from it. They evoke that same eerie sense of something human-shaped aping our movements: a thing that isn’t quite a person but isn’t quite not. Add a bunch of them together and you have a horde of faceless enemies with no mercy. But the scarecrows’ actions get at some ideas that are a hell of a lot scarier than their appearance. Doctor Who has long been a show that at least attempted to solve problems through intelligence and negotiation rather than violence. The Doctor, in particular, rarely wields a weapon. John Smith, however, is not the Doctor. As a part of the boys’ education, John teaches them to fire guns. Even when they’re just running drills, it’s unnerving to see a once-pacifist character teach prepubescent boys to use machine guns – more so when we remember that this is 1913. Fast forward to the night of the scarecrows’ attack. It’s dark. The school’s doors and windows are barricaded. Scarecrows pound on the doors. The wood begins to splinter. A line of children stands their ground, their weapons drawn. The beauty of this sequence is that the scarecrows don’t need to be frightening. Maybe they are, or maybe they don’t quite do it for you – but the boys’ fear is enough. They hold the line against the first wave of attackers, but eventually fall and have to be rescued by some magical Time Lord plot device. Now, there’s a fair bit more to the story than this – something about a romance plotline, embracing mortality, blah blah blah – but we’re here for the scarecrows, so let’s zoom in on this scene. I’m going to argue that this scene is more emotionally effective because the boys are shooting at scarecrows. You might think that it would hit a lot harder if their enemies were real flesh-and-blood human beings. And, depending on what reaction you want from the audience, that’s true. The sight of children at war evokes real horror and despair – a little dark for an episode of Doctor Who, perhaps, but also too heavy-handed to deliver the episode’s real message. It’s 1913. The audience knows that World War I is on the horizon – and in case you weren’t paying attention in history, one of the boys has premonitions of a French battlefield to remind you. It’s nearly impossible to watch this scene without seeing the parallelism. Within a year, these boys will be asked to fire on real people. But not yet. These scarecrows act as intermediaries between punching bags and human beings. Will the boys become desensitized to killing? Or will they still have tears in their eyes a year later? By placing the enemy in this uncanny valley, the writers leave us uncertain about whether the boys will – or should – find it in themselves to fire on living, breathing people. That layer of uncertainty not only creates suspense, it allows the audience to draw their own conclusions. Pretty clever for a scarecrow without a brain. But to bring it back to something that I’m sure the Doctor would agree with, our real monster here is not the strawman, but war itself. Not to mention that war has made its fair share of scarecrows – at least, if you believe TS Elliot’s hollow men. For these episodes, it’s fitting imagery. But the scarecrow has one last eerie message for us before the story ends. When the Doctor finally returns – as we all knew he would – he defeats the villains who hunted him down to steal his eternal life. And he punishes them by giving them exactly what they wanted. Each of the four villains gets their comeuppance in a different way. If you ask me, the most haunting is definitely the one who is trapped in a mirror for all of eternity – but the one that’s relevant here is the one who commanded the scarecrow army. The Doctor traps him in time so that he can’t move or age – he will indeed live forever – and puts him up on a scarecrow’s post. He’ll be trapped in a prison of his own making until the end of time. Poetic justice, perhaps. But it’s also unsettling when we see the Doctor this vindictive. Maybe he’s had a little too much experience with human nature.